Near the northern end of the sedate Island Highway 19 on Vancouver Island is the turn off to the town of Holberg and Cape Scott Provincial Park. In complete contrast to the paved and maintained highway, the road to Holberg is a rough gravel logging road which winds through the wilderness of Northern Vancouver Island. 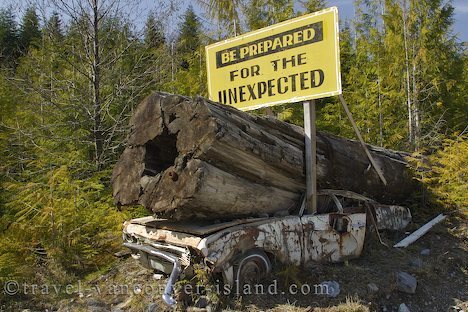 Prior to reaching Holberg, those game enough to tackle the rough road will see this funny sign - "Be prepared for the unexpected". Read the story behind the funny sign, told by someone who knew the owner of the doomed car! Photo of a funny sign along the gravel road to Holberg on Northern Vancouver Island, Canada.